It's a real shame Iris isn't getting the figure treatment the character deserves. We tried, but those plans didn't pan out. In lieu of the real thing, though, studio Madhands has whipped up one excellent gargae kit. We first saw this kit several months ago; today, it's assembled, colored and ready to be sold at Hobby Rock. When built, Iris stands at roughly the same height as D-Arts Mega Man X and Zero. Her attire is based on her appearance in Mega Man Xtreme 2. In a word, snazzy. You can check out more images here. We'll be looking at more Hobby Rock figures when the festival kicks off in February, 2015. Something is off about the face or the neck. 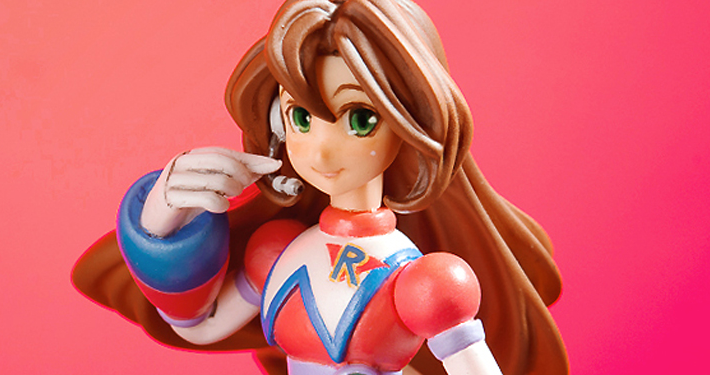 I previously put a comment explaining that the figure didn't really look like Iris, outside of a slight resemblance to the anime cutscenes presented in X4 with green eyes in replacement of blue. I guess it didn't go through. You too?! I see something odd about her too? I mean I know shes from the design of Xtreme 2, and maybe was designed a bit different from the sculptors perspective, but she still has something odd about her. Yeah, I think it's her neck. It just seems too... elongated. Combined with those big round eyes it looks like she's from the Sailor Moon anime. Neck's too long, her irises (ironically) are too big, and her eyes shouldn't be shiny. Hair's also too detailed, but whatever. She doesn't really look much like Iris, well kinda the anime cutscene of her in X4. It's an ok figure though, not much to complain about. I'm gonna be honest though if not for this random "we need an Iris figure" news posts I'd completely forget about the character. I would prefer a Splash (not calling her Woman) figure, she has a much more memorable design IMO. Also you guys did try, it's not Bandai's fault she got ninth and later third with the winners getting the figures as suggested. Oh one more thing, this mo*** f** Zero right here, godamn. Hi-GO! 's amazing artwork makes those crappy Ariga designs look bearable. I just wanted to point out that this pick takes me back to the 90s when Mega Man (and Final Fantasy/Square) was the s*** and anime was sweet and fresh. If they remade the Zero series on consoles, this is the aesthetic I'd want them going for, and man would it be great to see it on a front cover like that. Anyway it would mean a lot if anyone found or found out how to get that artwork fully without text, and pointed me in that direction. I'm actually on the fence on wither or not to get her. I already made my list of what kits I wanna get and placed order for them, but I'm on the fence to get her or not. I'm a fan of MadHands as I own a few of their kits/work, but not sure on to get her, ughhh... why couldn't they go with X4 design, that one I would get for sure! But this version... not sure. Plus even more since shes not articulated, which I'm not that into. I prefer kits/figures that have articulation. But over all she looks good, really like the pictures they took of her with X and Zero, the colors just stand out very well! But I'll see if I get her or not. But still as you can see, fans put in more work! MadHands is doing what Bandai failed at. Its actually Iris! She looks like Jane from Disney's Tarzan.